Holy Covenant UMC maintains an emergency food pantry for those in need. The food is non-perishable items purchased through the North Texas Food Bank. Clients may receive food once per month per household. Tuesday, Wednesday and Thursday from 10:00 a.m. to 2:00 p.m.
Holy Covenant accepts either money or food for the pantry. 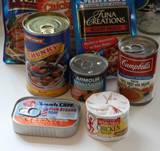 Protein items are always needed, especially canned meats, tuna, chicken, chili or stew. For more information call (972) 492-2432.